House Call Doctor provides after-hours medical services for multiple Queensland cities and Tweed Heads in northern New South Wales. House Call Doctor employs 1200 home doctors, has 40 cars and the service is 100% bulk billed for people with Medicare and DVA cards. To book a home visit, you can call 13 55 66, download the app or book through the House Call Doctor website. Our doctors can treat a variety of ailments including cold and flu symptoms, general illnesses, minor lacerations, trauma needing stiches, animal bites and severe pain. House Call Doctor has more than 1200 doctors and 40 cars. Since September 2015, the 2 million residents of Brisbane have been serviced by House Call Doctor, with after-hours doctors available from Caboolture to Beenleigh. In the coastal city of Bundaberg, House Call Doctor provides an alternative to visiting hospital emergency departments when their regular GP is closed. In Far North Queensland, House Call Doctor provides after-hours doctors for residents, helping with peace of mind and reducing strain on local hospitals. This industrial city in central Queensland has after-hours GPs visiting patients from Gladstone to Tannum Sands. Residents and visitors to the Gold Coast can rest easy knowing that House Call Doctor provides after-hours medical attention to those in need. Doctors can visit homes, hotels and resorts making home doctors easy to access on the Coast. House Call Doctor provides access to after-hours doctors in Gympie. House Call Doctor provides after-hours care to patients from Burrum Heads to River Heads in the Hervey Bay region. In Ipswich, House Call Doctor can visit patients in their home, hotel or aged care home. House Call Doctor has been helping patients in Mackay since July 2016. The expanding city of Maryborough has had access to House Call Doctor services since 2015, reducing strain on local hospitals. The arrival of House Call Doctor in the Rockhampton region provides medical care for the people of Rockhampton. Now residents have a choice of medical care options after business hours when their GP is closed. The Sunshine Coast is a popular tourist destination, and holidays are more enjoyable when you feel 100%. Since February 2016, House Call Doctor has been keeping residents and visitors healthy with home visits after-hours. Residents in this inland city have access to home doctors through the House Call Doctor service. Townsville locals have benefited from House Call Doctor services since September 2015. 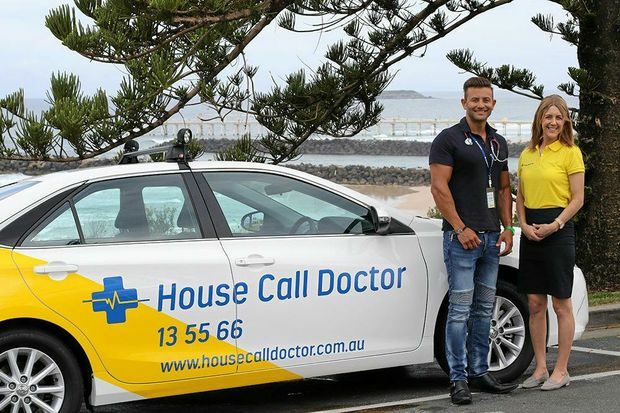 House Call Doctor expanded outside Queensland for the first time with its entry into the Tweed Heads area. House Call Doctor has been available from Tweed Heads to Kingscliff since December 2016. Residents of the Wide Bay area have access to this important medical service, catering to areas including Bargara, Bundaberg and Hervey Bay.